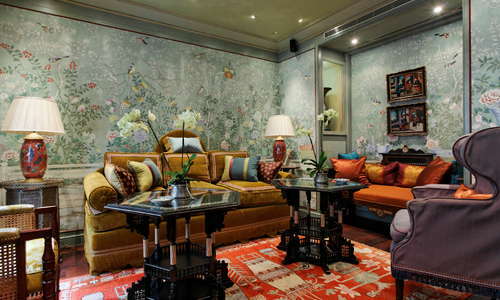 A contemporary antidote to the minimalist trend, this Relais & Chateau property, set in a quiet residential area near the Champs-Élysées, is lavishly decorated in rich fabrics and antique furnishings from France, North Africa, and especially the Far East. 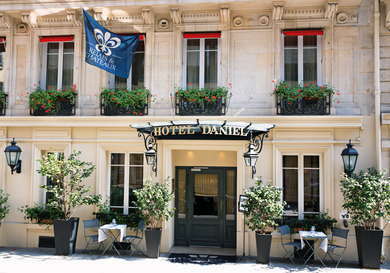 Small and intimate, the Daniel has a loyal following for its uniquely Parisian opulence. YOU SHOULD KNOW As comely and plush as this hotel is, if you're looking for where the action is this may not be the place for you. 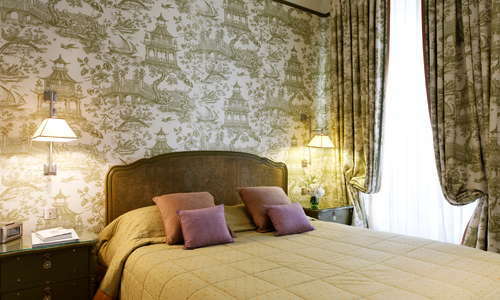 Rooms all have toile de Jouy fabrics in varying color schemes, colonial-style antique furnishings in mahogany or teak wood, and plush carpeting, together creating an atmosphere of intimacy and coziness. 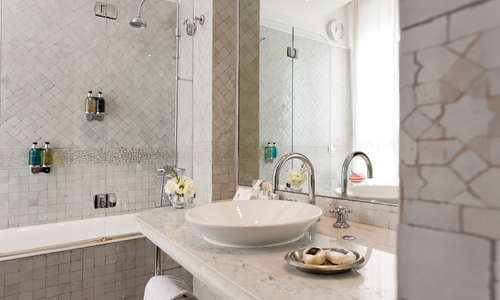 Little luxuries include lavender sachets, padded hangers in the closets, and glass jars of sea salts in the bathrooms. 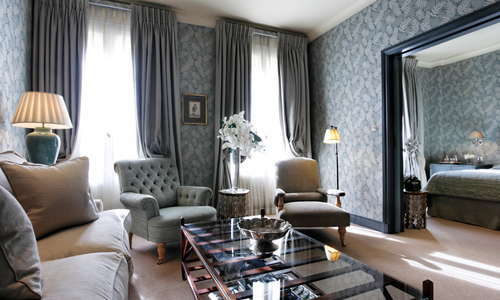 Rooms on the second and fifth floor have small balconies with pretty views over this very Haussmannian neighborhood. 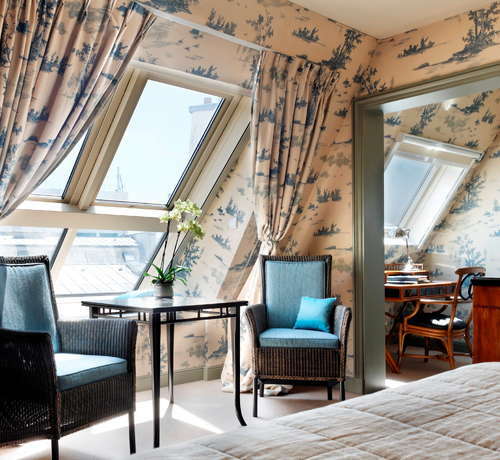 Rooms on the upper floors have Eiffel Tower views. Snag a fifth-floor balcony and watch the Iron Lady sparkle every hour on the hour after nightfall. 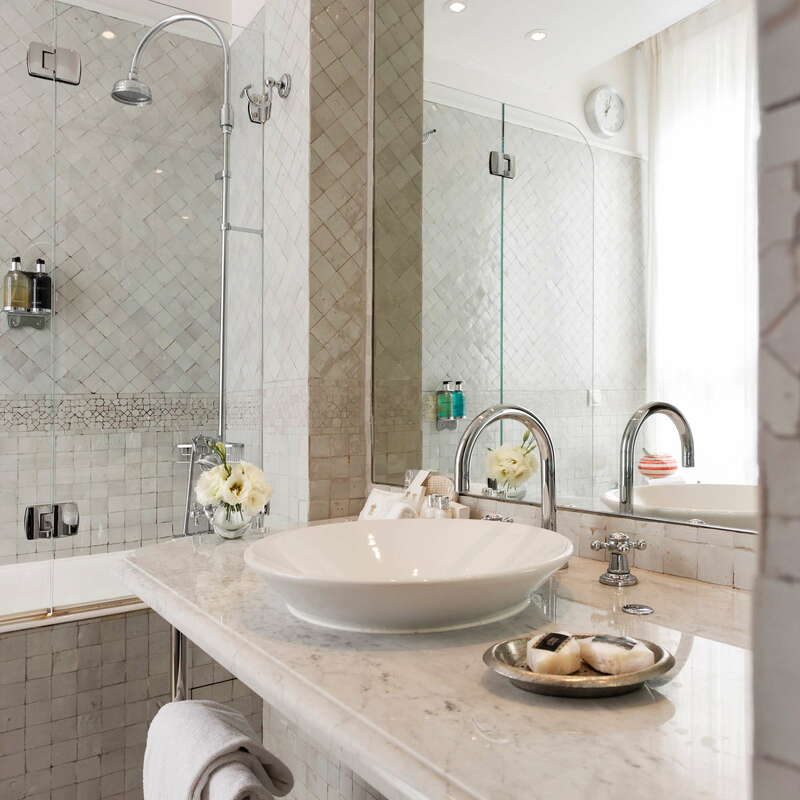 Marble or Moroccan-tiled baths are ample enough for a large bathtub with shower or, in the smaller rooms, a spacious walk-in shower. Higher category rooms have double sinks and daylight. 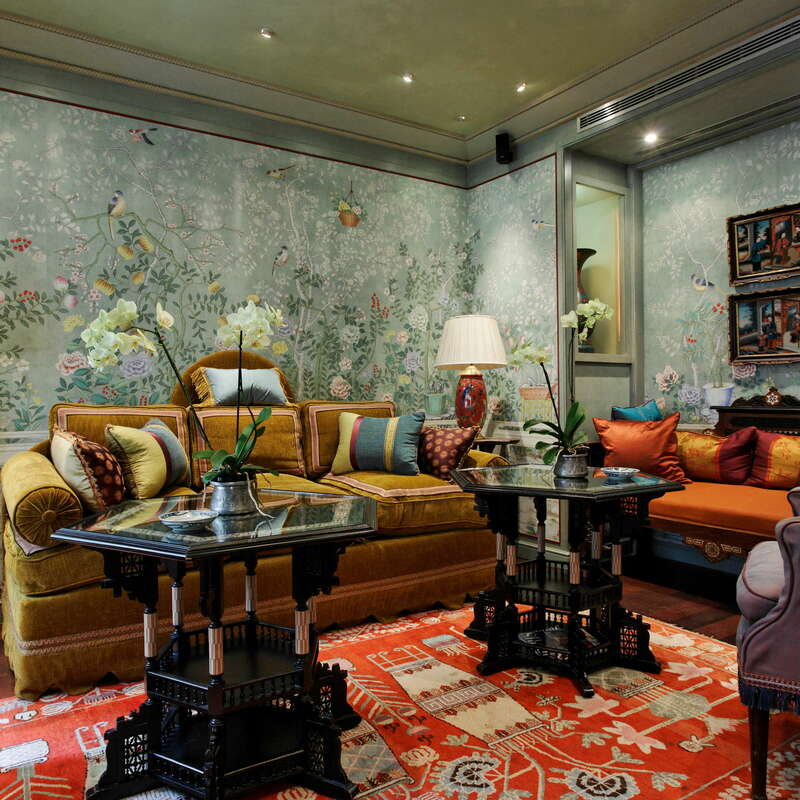 The lobby at this Relais & Châteaux property feels like a living room, with deep sofas covered with colorful satin pillows, dark hardwood floors, and delicate hand-painted Chinoiserie floral wallpaper. 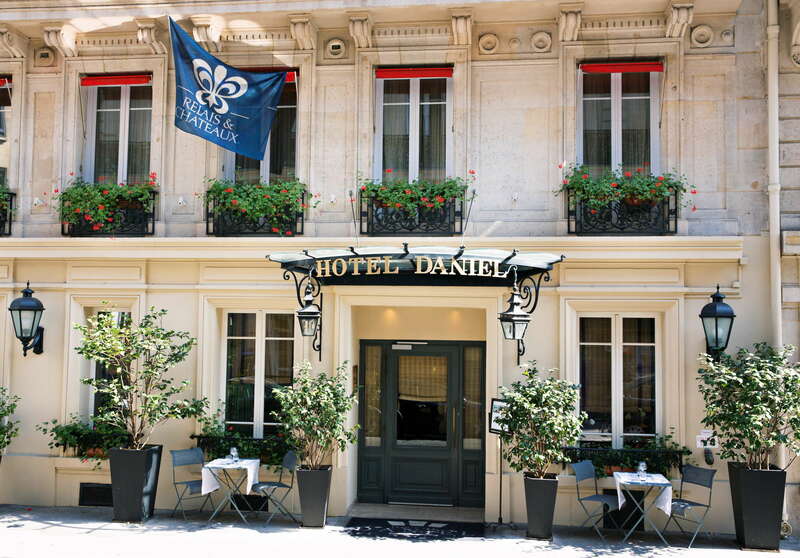 Set in a light-filled atrium-like space with comfy banquettes, the hotel's jewel-like Le Daniel restaurant, featuring deluxe salads and lighter gourmet fare, is open weekdays for lunch and dinner to guests only. Parisians and visitors alike enjoy the Daniel's relaxing British-style afternoon tea, served on elegant silver and linen. Weekend brunch, also open to non-guests, is a lengthy affair, with all the favorite French dishes that last you throughout the day. 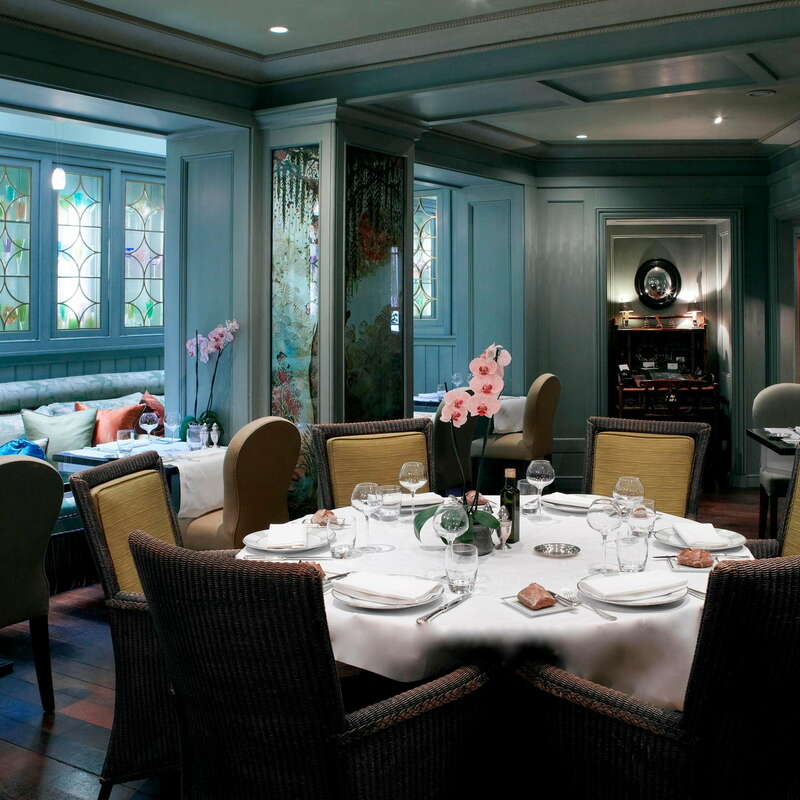 An elegant à la carte breakfast is served seven days a week in the restaurant. YOU SHOULD KNOW As standard in this neighborhood, prices are high. But you are also paying for higher quality. 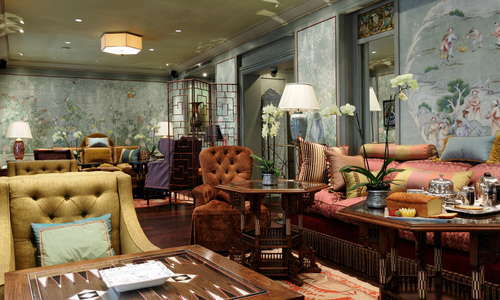 The cozy bar, set in the restaurant and tea room, is a charming place for a relaxing drink, whether or not you're dining at the hotel. Considering the lack of intimate bars in this neighborhood—except at other hotels, which can be quite pricey for a glass of wine or cocktail—this is not a bad place for a drink at the start or end of your evening. Within a few minutes walk to the Saint-Philippe du Roule metro station, which goes direct to the Eiffel Tower. About an 8-minute walk to the Franklin D. Roosevelt stop, serving line no. 1, Paris's fast central line. Set on a quiet street between the Champs-Élysées and Rue du Faubourg Saint Honoré, not far from the Élysée Palace, the president of France's residence, this is an upscale, mostly residential neighborhood, home to many of the city's best hotels and within walking distance to some major tourist sights, including the Arc de Triomphe and the wonderful Musée Jacquemart-André (with its famous tearoom), as well as loads of high-end shopping. Though you may feel a bit off the beaten path, the hotel is close to public transport that takes you pretty much anywhere in Paris quickly. 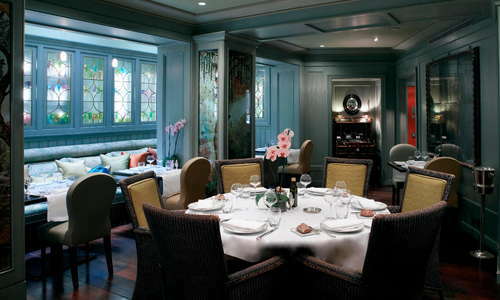 Some of Paris's top gastronomic restaurants are an easy walk away (many in other hotels), including Le George at the George V hotel, La Scène at Prince des Galles, Alain Ducasse at the Plaza Athénée, and Epicure at Le Bristol. For an excellent seafood plate, Helen, a small bistro within easy walking distance of the hotel, is one of the neighborhood's best spots for fresh aquatic delights with superb wines to match. 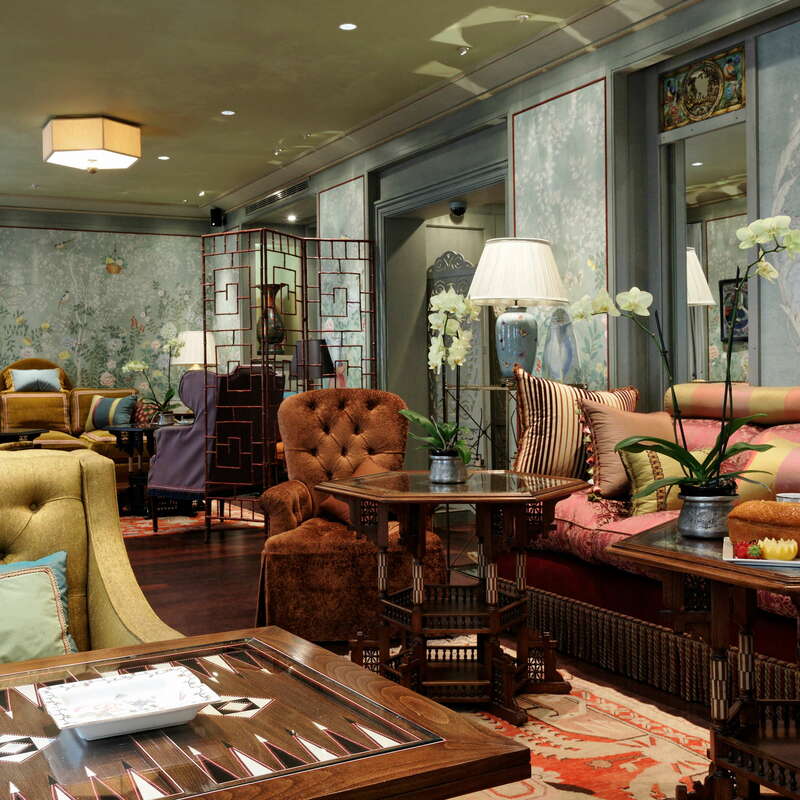 Your best bet for a good cocktail are the hotel bars, we love Les Heures at the Prince des Galles, but Le Bar du Bristol, though pricey, is also a great place for an elegant evening out, and on Tuesdays the bar hosts a live DJ. About 10 minutes away on foot, La Réserve hotel's lovely scarlet-clad bar is a sumptuous place for a nightcap, especially by a roaring fire in winter. 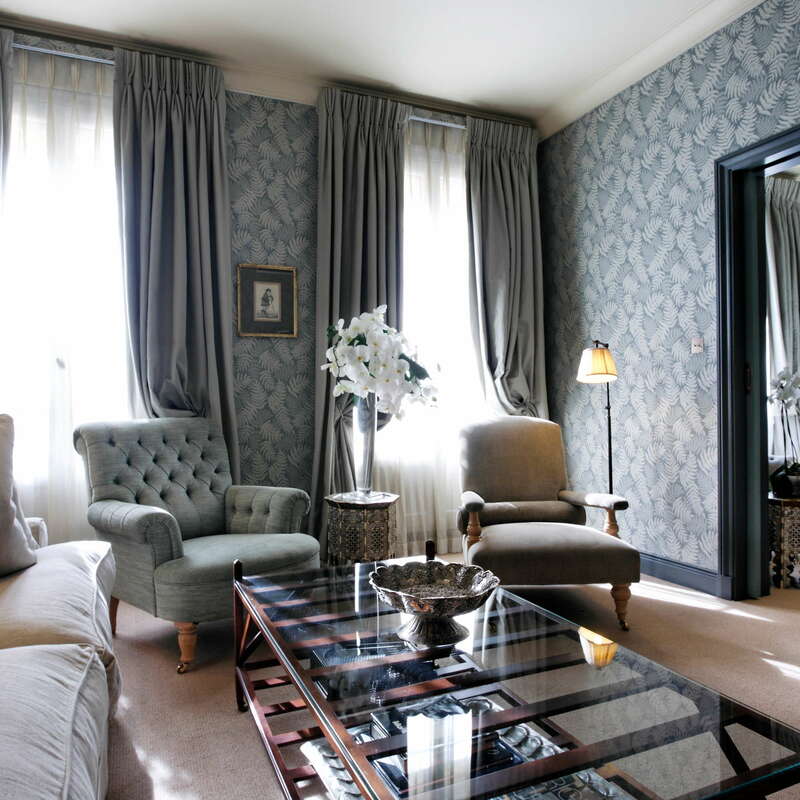 Hotels are often being described at having that "apartment in Paris" feel, but this one really does, especially if you like a touch of opulence. 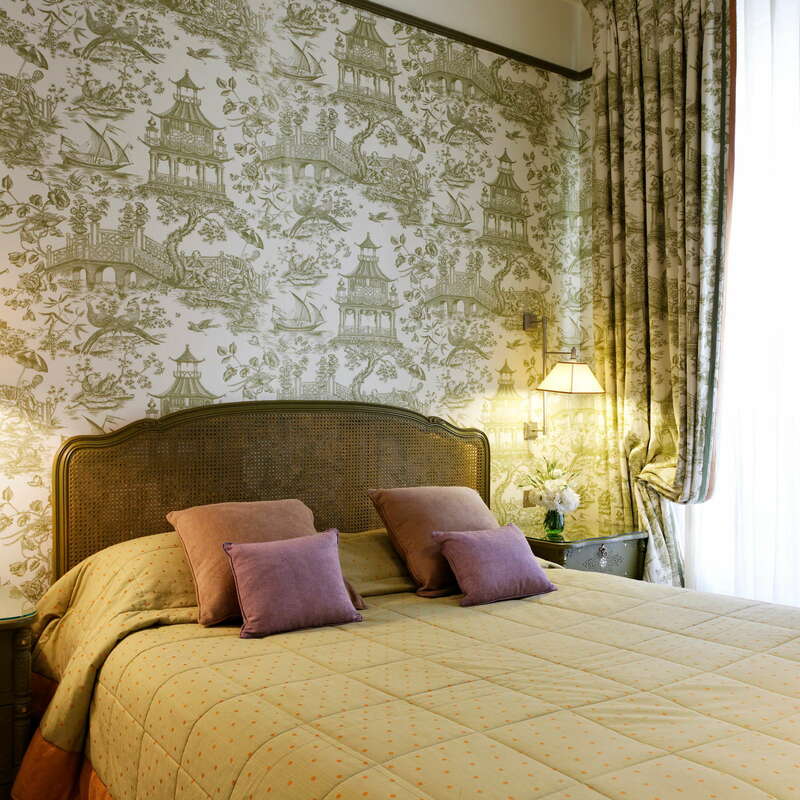 Prices for this neighborhood aren't bad either, and you're assured of a certain standard by the Relais & Chateau imprimatur.